Lydia is dead. But they don’t know this yet… So begins this debut novel about a mixed-race family living in 1970s Ohio and the tragedy that will either be their undoing or their salvation. Lydia is the favorite child of Marilyn and James Lee; their middle daughter, a girl who inherited her mother’s bright blue eyes and her father’s jet-black hair. Her parents are determined that Lydia will fulfill the dreams they were unable to pursue—in Marilyn’s case that her daughter become a doctor rather than a homemaker, in James’s case that Lydia be popular at school, a girl with a busy social life and the center of every party. I really enjoyed Ng’s beautifully written debut. It’s a quiet drama in which assumptions and lack of openness have built up in the Lee family for years, coming to a boiling point with teen daughter Lydia’s untimely death. The mystery surrounding her death was as compelling as the family dynamics and kept me enthralled with reading the book. My heart ached for the characters, all of them! I couldn’t believe how blind James and Marilyn, the parents, could be to their children as their own individual people. And poor Hannah! I don’t want to spoil anything, so you’ll have to read it to see what I mean. Ng’s writing is subtle, but exposes the family’s fragility as a whole and each person’s vulnerabilities well, gradually and acutely building tension right up to the last few pages. The author really fleshes out each character, rendering them all in full dimensions while exposing racial and gender issues as well. I loved that this is set in the 1970s, too. 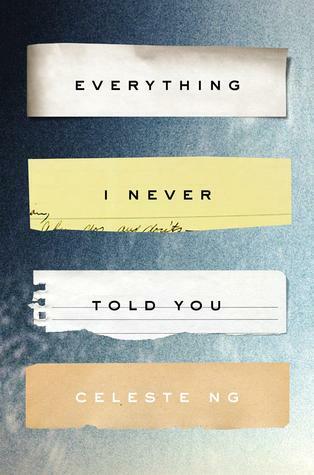 If you’re into contemporary literature and secretive family drama with a touch of mystery this I can’t recommend Everything I Never Told You more highly. One of the best 2014 books I read in 2014! Read from December 13 to 18, 2014. This entry was posted in books and tagged drama, family, female adolescence, fiction, historical fiction, mystery, society by kristin @ my little heart melodies. Bookmark the permalink.